Meanwhile, heat 2 tablespoons oil in a large skillet over medium-high heat. Add the red onions, bell peppers, green onions, and garlic, and saute until tender and lightly golden, 5 to 6 minutes. Season with salt and pepper and remove to a bowl. Add the remaining 4 tablespoons oil to the skillet, and then add the drained and dried sweet potatoes. Cook in a single layer, stirring occasionally, on medium heat until they are tender, about 6 minutes. Increase the heat to high and cook, without stirring, until the potatoes are golden and crisp, about 2 more minutes. Sprinkle with the smoked paprika and gently stir in the onion mixture and parsley. 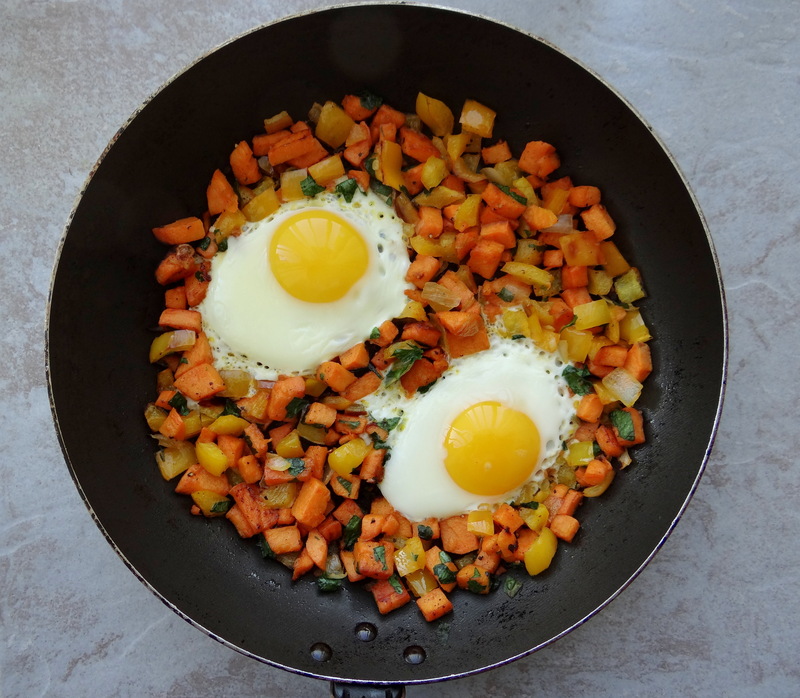 Beautiful in the pan– never had sweet potato hash either– but it looks like a great one! !